Situated in central Tanzania, the Ruaha National Park is one of the largest protected areas in Africa. 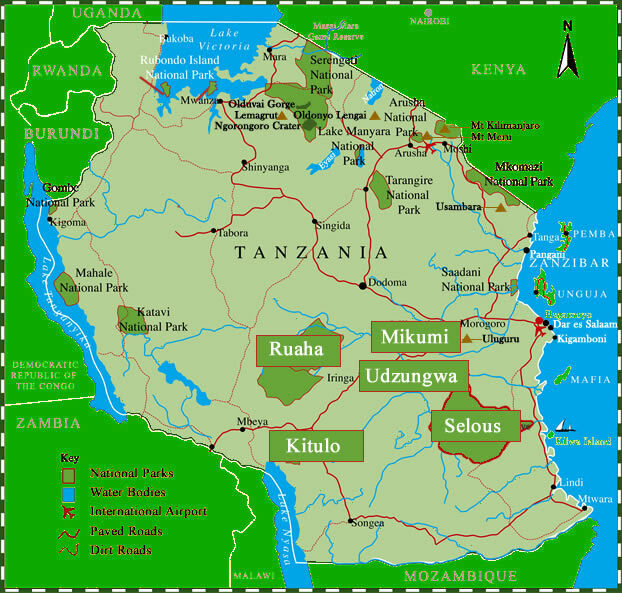 It is the second biggest national park in Tanzania but since visitor numbers are comparatively few, it possesses a true wilderness atmosphere. Ruaha covers nearly 13 000 square kilometres but is part of an even larger natural system, incorporating the adjacent Rungwa, Kigozo and Muhezi reserves to the north. The reserve takes its name from the permanent Ruaha River which winds its way north-east and then south into the Rufiji River before spilling into the Indian Ocean. Only a small part of Ruaha is actually open to visitors who can explore a network of tracks along the main river and its many seasonal tributaries, as well as into the Baobab-clad hillsides and tall miombo woodlands. The variation in altitude and topography has given rise to wide diversity of plants and wildlife, which is greatly enhanced by the permanent water of the Ruaha River. In addition to these factors, Ruaha is also situated in an ecological transition for east and southern African species. Ruaha is an astonishing reserve which can provide even the most experienced African travelers with something new. The undulating topography, glorious river and majestic trees combine to produce one of Africa's most captivating landscapes. Enormous Baobab trees are a key feature of Ruaha, where almost all individuals bear the scars of the huge elephant population. Elephant relish the succulent bark of Baobab trees and gouge into the tree trunks with their powerful tusks. Other impressive Ruaha trees include Tamarind, Jackalberry, Wooden Banana, Pod Mahogany and Newtonia. Virtually all of Africa's large mammal species are found in Ruaha. Hippos are abundant in the broad Ruaha River. Large carnivores are well represented, good populations of Lion, Leopard, Cheetah, Spotted Hyena and Wild Dog occur throughout Ruaha. The park is also famous for its huge Elephant and Buffalo herds and variety of antelope species including both Greater and Lesser Kudu, Roan, Sable and Eland. Small herds of agile Grant's gazelle occur in the open plains of the north-west. Wildebeest are oddly absent in this part of Tanzania. Troops of Yellow Baboon wander the woodlands, while small numbers of Black-and-white Colobus reside in riparian forest. Among smaller carnivores, both black-backed and side-striped Jackals occur alongside Honey Badger, African Civet, Serval and Egyptian mongoose. For birdwatchers, Ruaha is a truly marvelous destination, with over 500 species. Of particular interest is the Tanzanian Red-billed Hornbill. This hornbill is abundant at Ruaha where it is often seen alongside African Grey Hornbill and Von der Decken's Hornbill. Other birds of the savanna and woodlands are Ashy Starling, Nubian Woodpecker, Bare-faced Go-away Bird, White-headed Buffalo-Weaver, Grey-capped Social-Weaver, Red-faced Crombec, Swallow-tailed Bee-eater, Collared Palm-Thrush and Crested Barbet. Raquet-tailed Roller, White-breasted Cuckooshrike and Spotted Creeper are among species found in miombo woodlands. Raptors and waterfowl are well-represented, with African Skimmer and White-crowned Lapwing breeding on the extensive sandbars of the Ruaha River.